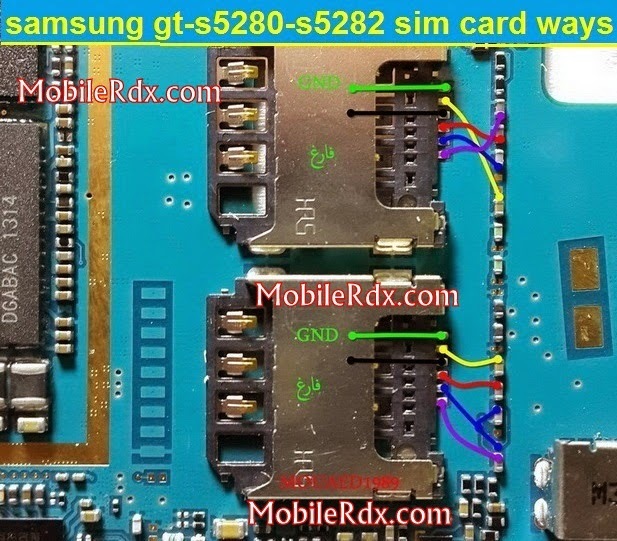 Hardware method to solve Samsung GT-S5282 Insert Sim Problem. which is known to be one of the most successful phone of Samsung. Normally Samsung S5282 doesn’t encounter much problem, but if it does there is always a solution. Heat Gun / Heat Blower. Remove, clean and re-insert your SIM card. Check with any other SIM card. Check the SIM card pin connectors for possible damaged, replace if necessary. Check and trace the sim card track ways marked in below image with the help of a multi-meter, if any of them is faulty make a jumper.